ניתן להזמין באתר ללא חובת השארת כרטיס אשראי עי בחירת אשראי טלפוני. המשלוח באתר חינם בדואר רשום עד מוצרים של 2 עד 14 ימי עסקים! אספקה באמצעות שליח ,בתשלום נוסף . זמן האספקה מתקצר משמעותית בבחירת אספקה ע"י שליח. איך נשמור על הסוללה למחשב שרכשנו ? מערכת אנרגיה סולארית איך זה עובד? מצלמה בעלת תפריטים בעברית לניווט והתמצאות קלה ומהירה. אפשרות שליטה על העדשות מה יוקלט. 170 Degree super wide angle lens video recorder, 4" IPS 1080P HD display, motion detection, G-sensor, Night Vision Fill Light, parking monitor, support TF card, etc. Perfect for your safety driving! 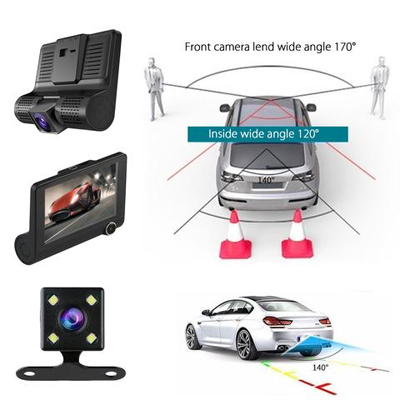 3 Lens: with three cameras to record, the front camera is Full HD 1080P, the rear view camera is 720P and the inside camera is 480P, can record anywhere around your car and inside of your car. Multifunction: HDR video, loop recording, no leakage of seconds, 170 Degree super wide angle lens video recorder, 4" IPS 1080P HD display, motion detection, G-sensor, Night Vision Fill Light, parking monitor, support TF card, etc. 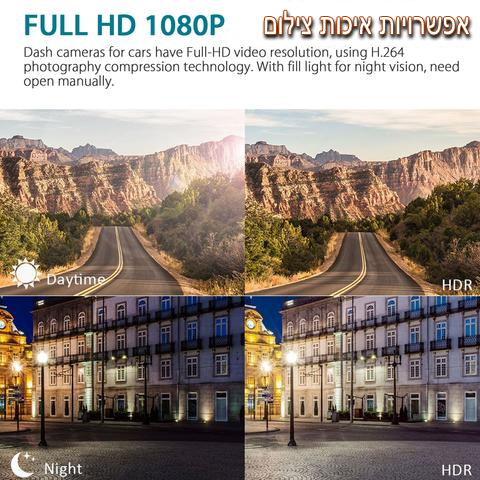 FULL HD 1080P and Night-vision: dash cameras for cars have Full-HD video resolution, using H.264 photography compression technology. With fill light for night vision, need open manually. Smart G-Sensor: will keep the important fragment recorded by G-sensor in your Micro SD Card, but not overwrite them by the Loop Recording system. Motion detection: Will turn on the video when the front movement is detected, otherwise the recording will stop. Loop Recording: Seamless Loop Recording system provides theoretically unlimited storage from the SD card. Smart safety detection system will always keep the important fragments in your SD card, and loop recording system will automatically overwrite the non-essential part when the memory card gets full. Wide angle: front camera lends wide angle 170-degres, inside wide angle 120-degree, rear wide angle 140 degree. 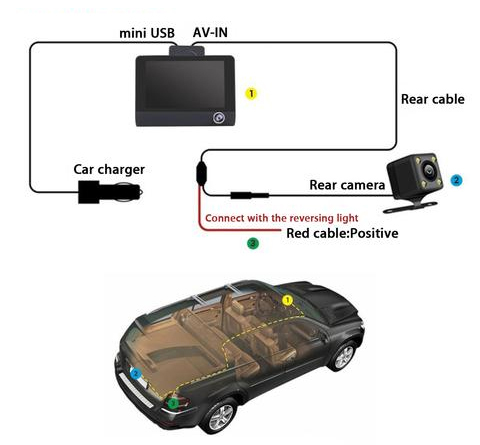 Picture in picture display: allow to choose different viewing angle, picture in picture, wide angle, more secure driving. For more detailed functions and operation, please refer to the user manual. There is screen film in front to protect from scratching,pls kindly remove it to use. Function: loop recording, parking monitor, motion detection, G-sensor, language setting, sound record, date/time setting.